Dietician: As far as healthy nutrition goes, canola oil is probably the best. Chef: Canola oil has a medium-high smoke point of about 425 degrees F. It is great for sautéing, baking, and stir-fry. Of all the oils, it can be used to create the most variety of recipes. My opinion: I do not like canola oil. I would not even include in my top ten choices, let alone make it number 1. Canola oil contains erucic acid. While some debate how bad erucic acid really is, no one argues that it is good for us. Canola varieties containing less and less omega-3 fats are being selected to improve the oil’s shelf life and much of the crop is genetically modified. I see no reason whatsoever to use it. The chef seems to be saying that canola is easily used in cooking because it has a neutral flavor. I instead recommend using oils that add a flavor you like to whatever you are making. Dietician: Walnut oil contains polyunsaturated fats, and is also a good source of omega-3 fatty acids. This is a very heart-healthy oil, and is a great cooking oil to use if you are diabetic. Chef: Walnut oil has a very high smoke point of about 400 degrees F, which makes it a great oil to use for baking. It’s also great for sautéing at low-medium heat. It can also make your salad pop, simply by drizzling it over the top. My opinion: Unrefined walnut oil actually has a yet lower smoke point (320 degrees F) but more importantly, it seems that the smoke point and the point at which you begin to damage the omega-3s in the oil are different. Drizzle walnut oil on your food, do not cook or bake with it. Finally, omega 3 fats are good for us all, diabetic or not. Dietician: Flaxseed oil contains polyunsaturated fats, and has a good source of omega-3’s. Omega 3 fatty acids help improve brain function and promote heart health. Chef: Flaxseed oil has a low smoke point of about 225 degrees F, so it should not be used for cooking over heat. Instead, it’s great for mixing into meals after heating, or it can be added to salad dressings or used in certain smoothies. My opinion: Flaxseed oil is a good source of omega 3s. It is very fragile and once rancid loses all health benefits. I agree it should not be heated. In fact, the oil is so fragile that I prefer to grind flaxseeds and sprinkle them on my food. I am not a fan of smoothies. Dietician: Olive oil is healthy because it contains monounsaturated fats, which makes it very heart healthy. Chef: Olive oil has a medium smoke point of about 350 degrees F. It’s a great, flavorful oil for foods like pesto sauce and salad dressings. It’s also great for sautéing vegetables, and is a great choice for cooking chicken. My opinion: Extra virgin olive oil actually smokes at 400-410 degrees F. The oil has been used in many cultures to sauté all types of foods. It is a healthy, sturdy oil with a ton of data supporting its benefits. I recommend it as the best oil for every day use. Dietician: Almond oil also contains monounsaturated fats, which makes it good for your cholesterol. It’s also an ideal cooking choice if you are diabetic. Chef: Almond oil has a high smoke point of about 495 degrees F, and is good for high heat cooking, like sautéing. It’s great flavor also works well as a healthier substitute in dessert recipes, like whipped cream. My opinion: Other sources put almond oil’s smoke point at 430 degrees F but I agree that a well made almond oil is healthy. This dietician seems unduly obsessed with the effect of oils in diabetes. I agree with the chef that nut creams often make a good substitute for dairy but I make my nut cream from nuts, not nut oils. Dietician: Peanut oil also contains monounsaturated fats, and is low in saturated fat, making it a heart healthy option. Chef: Peanut oil has a medium smoke point of about 350 degrees F. This is a good oil for light sautéing and frying. It’s great to use in Thai and Asian recipes, and is a great addition to sauces and salad dressings. My opinion: The problem with peanuts is that they are often contaminated with molds and are often treated with strong fungicides. While acceptable, it should not be favored as an oil. 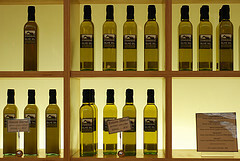 Olive oil is richer in monounsaturated fats. Dietician: Avocado oil is high in monounsaturated fats, and vitamin E. It’s a great oil to use if you are on a diet, or if you are diabetic. In certain studies, monounsaturated fats have been shown to help control insulin levels and blood sugar. Chef: Avocado oil also has a high smoke point of about 510 degrees F. This makes it a good oil for high heat cooking, like sautéing and frying. It’s great in salads, and can be used to add a little extra flavor to chicken, beef, pork or fish. My opinion: Avocado oil is a healthy oil, good for the heart, whether you are on a diet or a diabetic or not. It is a great high heat oil. It has a lovely flavor that blends very well with a little walnut or pumpkin seed oil. The only problem with avocado oil: It is often solvent extracted so shop for a truly well made avocado oil. Important note: I was contacted by Chosen Foods (makers of a cold refined organic avocado oil ). They pointed out that any high heat tolerant avocado oil will have been deodorized. In its natural – and more flavorful – state it is not a high heat oil. Dietician: Also low in saturated fat, using safflower oil to cook with can help lower your cholesterol. A lower cholesterol also means a reduced risk of cardiovascular and heart diseases. Chef: Safflower oil also has a high smoke point of about 450 degrees F. This makes it good for high-heat cooking, like sautéing or frying. It has such a distinct flavor and it’s great for cooking foods like chicken and pasta. My opinion: Safflower is high in omega-6s and should be used sparingly, more as a flavor. For regular sautéing of vegetables olive oil’s smoke point of 400+ degrees F. is adequate and healthier. Dietician: Sunflower oil is also heart healthy, and contains polyunsaturated fats and is low in saturated fats. It’s definitely a good ‘all purpose’ oil. Chef: Sunflower oil has a high smoke point of about 460 degrees F. This oil is great for high-heat cooking like sautéing. It’s actually great for sautéing vegetables. My opinion: Sunflower seeds are high in omega 6s. This oil also should be sparingly, more as a flavor. For regular sautéing of vegetables olive oil’s tolerance of 400 degrees F. is adequate and healthier. Dietician: This oil contains polyunsaturated fats, and is low in saturated fat, making it very heart healthy. Chef: Grapeseed oil is very versatile, and can be used to add a very mild, nutty flavor to almost any dish. It’s great for salads, and can make for a nice drizzle over toasted bread. My opinion: Grapeseed oil can be great but unfortunately most grapeseed oils are solvent extracted. If you want a mild nutty flavor in a dish, I recommend using nuts or nut oils. My recommendations: Use olive oil for most of your cooking and baking although I sometimes prefer coconut oil in baking. For occasional high heat cooking, use a well-made avocado oil. Good quality walnut, pumpkin seed, coconut, and toasted sesame seed oils are my favorites to add and enhance flavor. This entry was posted in Food and tagged avocado oil, canola, cooking oil, flax oil, high heat cooking, olive oil, omega 3, rancidity, smoke point, walnut oil. Bookmark the permalink. Kathy, could you talk about your thoughts on coconut oil? I like coconut oil but use olive oil as my main oil. I believe that saturated plant fats act differently in the body than saturated animal fats so I am not worried about negative effects from plant fats. I love coconut oil as a topical body oil and in that use vastly prefer it to olive oil. Hmm, I’ve also heard that erucic acid is not really present in significant quantities in canola oil. Do you have references showing a significant amount in canola and a risk to human health? When I need a neutrally flavored oil that can withstand heat in a recipe, canola, sunflower and safflower are the obvious choices, and of those, of course canola has a much better omega 3 to omega 6 balance. In the recipes I’m thinking of, I don’t want the taste of extra-virgin olive oil. I didn’t realize it was possible to sauté with avocado oil, that’s good to know. My approach is to try to eat foods that are good for me. I have no desire to incorporate an oil in my diet because it does not have “a significant amount” of a toxin. Yes, Canola is a low erucic acid containing oil. And there is evidence that in “reasonable” amounts it is not harmful. Do you have references for what a reasonable amount might be? In addition, many of the vegetable oils on the shelf have been deodorized to tolerate high heat cooking, a process that destroys omega-3s. Is your canola oil deodorized? Varieties of canola are grown that are much lower in omega 3s (better shelf life) and increasingly the plant is genetically modified. Plus there is good evidence that if all you are doing is sauteing, you do not need a high heat tolerant oil. Regarding Avocado and grape seed oils, are solvents used the production of organic avocado or grape seed oils? What are other tips for securing high quality versions of these oils? For cooking with heats higher than can be used with EVOO, would you favor avocado or coconut? You can find organic, cold pressed, non-solvent extracted avocado and grape seed oils but you need to look carefully as most grape seed oils are solvent extracted (as are most rice bran oils). I don’t think that the organic certification precludes solvent extraction but I’ve not looked into that. Re high heat cooking: First, I think most of us are not cooking at temperatures that require the use of other than a good EVOO; I think many of our worries in this arena are due to marketing efforts by makers of other types of oils. If I were high heat cooking, I would probably choose a cold deodorized avocado oil, like the one made by Chosen Foods (). Any avocado oil that tolerates high heat will be deodorized, most using high heat to destroy PUFAs in the oil. Is your preference for olive oil over coconut oil a matter of personal choice, or is there evidence supporting one over the other ? I recently switched over to using coconut oil as my main oil for cooking, mostly because of the high content of medium-chain triglycerides and its many other health benefits. Also, the fact that it can withstand high temperatures makes it a great choice for the high heat involved in indian and asian cooking. Would love to hear why you prefer olive oil over coconut oil? There is a world of research on the benefits of olive oil. The research on coconut oil is much more limited and much more in conflict because of the saturated fats in the coconut oil. And most sources suggest that unrefined, undeodorized coconut oil is not more tolerant of heat than olive oil. Looking for one more oil to add to make a nice flavored mayo. Currently use half avocado oil, 1/4 olive oil, 1/4 safflower (expeller pressed) but since you recommend against safflower, I’d like to replace it with something better for me. I find too much olive oil makes the mayo too bitter. I really recommend trying to find an olive oil that has a flavor you like — there are so many different types of olives. As well, I know Alton Brown said that what makes olive oil mayonnaise sometimes taste bitter is the use of a blender, apparently not such an issue if you make your mayo by hand with a whisk. So I am confident you could make a non-bitter olive oil mayo, just as the French are known to do. Avocado oil is fine as long as you are getting a properly extracted oil, not a refined, high heat tolerant avocado oil. Other tasty oils (again making sure you are getting a properly extracted (non-solvent, non-refined) oil) include pumpkinseed and walnut oil. Both can add a lovely flavor and the latter comes with some omega 3s to boot. Thanks so much. I’ll try whisking in the olive oil at the end and see if it makes a difference. I’m worried the nut oils may make the mayo too nutty, but it’s worth a try. Thanks again! Thanks! It totally worked. I used the food processor to get it going with the avocado oil then wished in the olive oil by hand and it was delicious. Much appreciated! Thanks! Nice Post about cooking Oil………..
My husband likes to make popcorn on the stovetop. What is the best oil to use? I do not recommend popcorn (hard to eat proportionately and omega 6 dominant). If I were doing popcorn, I’d definitely go for organic, air popped. If it had to be popped in oil, I would use EVOO because of its antioxidants. Using a high heat oil without much in the way of antioxidants and providing some trans fats makes no sense to me.